Why is there an enormous inflatable rubber duck standing at the intersection of Fumin Lu and Xinle Lu? You might say, “Why not?”, but there’s more to the story than that. This rubber duck mimics another, more famous one: the inflatable rubber duck that floated in Hong Kong’s harbor for a month before it departed for its next venue (Pittsburgh) last Sunday. The HK rubber ducky is the work of a Dutch artist, who’s been bringing his 54-foot-tall bathtub toy to locations around the world hoping that it will spark reflection and discussion as viewers ponder the duck. Rubber Duck, as the art installation is named, made a huge splash in Hong Kong as soon as residents of the city saw its smiling beak. Media outlets breathlessly covered the public infatuation with the duck; the South China Morning Post ran nine duck-related articles between March 23 and May 2, when the installation was unveiled in Victoria Harbor. Visitors to Hong Kong returned home with bags of duck-related merchandise. Tourists crowded the harborside for photos of themselves in front of the duck. And I’ll admit that I gave more than a minute’s thought to spending a weekend in Hong Kong so I could see the duck in person. But I should have known that I wouldn’t actually have to fly down to the SAR to experience the duck, or a decent imitation of it. 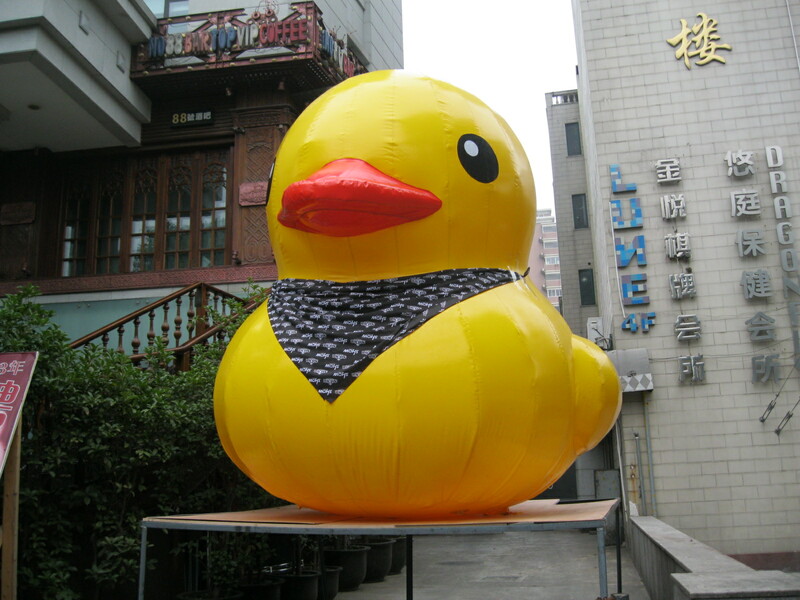 Much to the artist’s annoyance, inflatable rubber ducks soon began appearing in cities across mainland China, some of them closer approximations to the original than others. Real estate developers here have built replicas of Venice, Italy and Hallstatt, Austria; compared to constructing a town, copying an inflatable duck must have been a snap. The duck’s popularity came through in a very different way on June 4, the anniversary of 1989’s massacre in Beijing following the Tiananmen Square protests of that spring. A Hong Kong artist designed a version of the iconic “Tank Man” photo that replaced the menacing tanks with friendly yellow ducks; once the picture made its way to Weibo (the Chinese microblog equivalent of Twitter), it got censored by authorities, who banned the term “big yellow duck” for good measure (it was unblocked the following day). I shouldn’t be so happy to encounter a blatant rip-off of an artist’s work; I wouldn’t be at all pleased if someone plagiarized something I’d written. But when the sky is white with air pollution and the rain won’t stop falling, it’s hard not to smile back at the friendly sunshine-yellow duck down the street. I guess Shanghai’s June Gloom can make any of us a little … quackers. oh, you couldn’t resist the pun!!!! !